With Congress back in session this week, I’ve been thinking more about that trip, especially the way the Institute described the Senate as a deliberative, consensus-driven body that got things done – at least during Kennedy’s time in it. The Kennedy Institute sets itself apart from many other museums because it doesn’t just memorialize its subject, it encourages participation, challenging every visitor to live out Kennedy’s legacy of political action. Image credit: Edward M. Kennedy Institute for the United States Senate. Want to keep people from staring at their phones? Give them a tablet. As you enter the Institute, you’re given a tablet and ushered into a small room where a docent explains how the device gives you additional information about the exhibits and helps you navigate the museum. 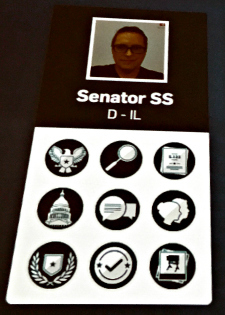 Next, you take a selfie for the electronic badge that uses your name and face during mock Senate votes and other game-like elements of the exhibits, essentially making you a part of the Institute itself. The tablets are surprisingly reliable and easy to use. I’m used to museum tech failing to deliver on its promise more often than not, but digging into historical documents and photos or creating amendments for bills meant my phone was in my pocket for most of the afternoon. 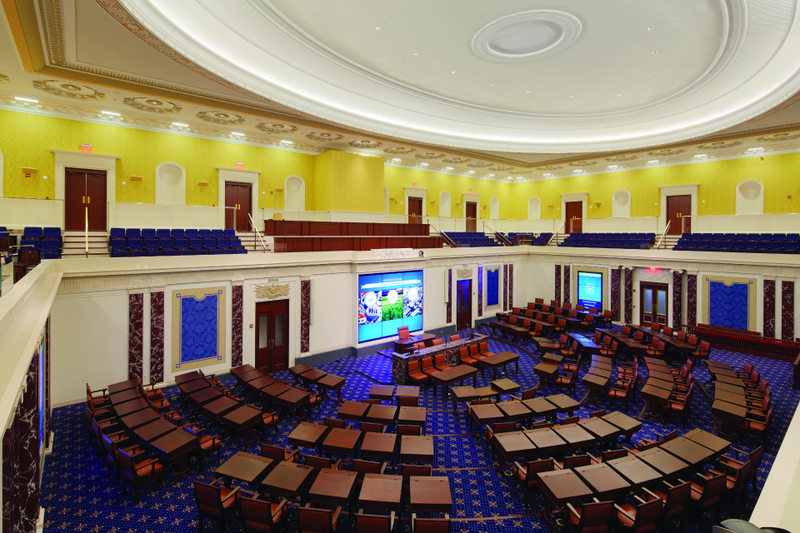 The literal centerpiece of the Kennedy Institute is a full-scale re-creation of the United States Capitol’s Senate floor. Like most things you only see on TV, including Mark Wahlberg, it is smaller than you would expect and somewhat disorienting to witness in person. But the wooden desks and high ceiling gave it a serious air. 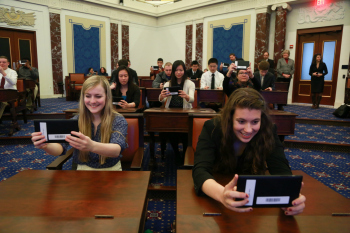 To bring to life current Senate bills and classic debates – like whether to join the League of Nations – docents step up to the rostrums and deliver speeches in favor or in opposition. The emphasis is less about historical accuracy (no one is cosplaying here) and more about experiencing the urgency of policymaking. If you like, you can get up and make your own speech on that day’s issue – I lucked out with patent trolls during my visit. Or you can dig into your tablet again and start competing with your cohorts in the game running throughout the Institute. When you were a kid in school did you wish sports had less to do with playing outside, physical ability and sweating and more to do with reading inside, contemplative analysis and thinking? If so, we should have been friends and also you would really enjoy the Institute’s accomplishments game. Each exhibit offers you a way to earn a related electronic pin, which denote things your knowledge of the issues or negotiation skills. It’s the “learn by doing” method. At the end of your visit, you can see how your accomplishments stack up against other visitors, some of whom can assist you in earning pins. It evokes politics’ competitive nature, the Senate’s need for consensus and a feeling that you’re a part of something bigger than yourself. Political science research has shown that getting people to write down their pledges and share it with others increases the likelihood that they’ll become more active in political and civic activities. Plus, it makes the Institute’s experience resonate long after you leave. As more digital, visual and immersive tools are available to museums, it’s worth debating what the role of a curator should be. Should the emphasis be on preservation or participation? Is there a greater need for storytelling or making a visitor a part of the story? Do museums need to create a legacy of satisfied visitors or public advocates? Most museums specialize in presenting information and context, but the engagement with the visitor is limited to what happens within its walls. Yet vibrant displays, hands-on tablets and gaming within a space can set up a continuation of the museum’s mission outside of a specific location. 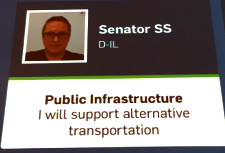 I walked out of the Kennedy Institute for the Senate ready to circulate petitions, become more deeply involved in local elections and maybe run for office. Or, to put it in Wahlbergian terms, the vibrations were good like Sunkist, making me feel the rhythm was my occupation. Should museums spur people to action or is it enough to merely document and showcase information? Can you feel it, feel it? Let me know on Twitter at @ourmaninchicago.